A Q&A with Frank Bardacke, whose new book Trampling Out the Vintage complicates the legend and legacy of Cesar Chavez. Frank Bardacke was down to his last few dollars when he visited a hiring hall run by the United Farm Workers (UFW) in 1971. Though only 30, he had already developed a reputation for militant activism, fighting for the creation of People’s Park in Berkeley and in 1967 being charged, as a member of the “Oakland Seven,” with conspiring to incite a riot in front of a military recruitment center. The group was eventually acquitted, with one media account noting that while the verdict was being read, Bardacke spent his time watching a basketball game on a television he had brought into court. He got a lot more than that. Dispatched to a lettuce crew, he watched a farmworker defy a foreman by tearing up a warning notice. The farmworker kept his job; the foreman was fired. The workers, on the heels of a victorious strike, were flexing their newfound muscle. “It wasn’t as dramatic as stumbling into a Detroit automobile factory in 1937, one year after the victorious sit-down strike,” Bardacke writes. “But it had some of the flavor.” The washed-out New Leftist had found a home. Trampling Out the Vintage skillfully tells the dramatic story of the rise and fall of the UFW, but what makes this a landmark book is its emphasis on the rank-and-file leaders, who are too often obscured by the long shadow cast by Chavez. It is these workers who are the heroes of Bardacke’s book—workers whose leadership was essential to the union’s success, and whose betrayal contributed to its eventual demise. You spent six seasons in the fields, working on celery and lettuce crews. How did your time as a farmworker influence the way you approached the book? If I hadn’t worked in the fields, there wouldn’t have been a book. I started just writing about farmworkers, telling the story of the UFW from the point of view of the militant rank-and-file lettuce crews. But that didn’t work. To make any sense of it, I had to tell the story from the point of view of the staff and the executive board as well. That’s the crux of it; that’s what’s so fascinating: the interchange between these groups. When they were working together, they were a very powerful force; and when in opposition, the union came undone. Early on you describe the life of a farmworker, especially in the Salinas Valley. When a previous crewmate asks you whether you miss the fields, you answer, “I can still feel the pain in my back, but I miss the life of the fields.” This seems like a strange statement, as we tend to think of farmworkers mostly as exploited victims. Well, if you believe in the image of the poor, powerless, hat-in-hand farmworker, you can’t understand what happened in the UFW. Because many farmworkers were not like that—they were very powerful people, and their power was built into the nature of agricultural production. The grower has to invest a whole bunch of money—plant, cultivate, thin—before he has a product to sell, and then he only has that product for a very short period of time. So farmworkers have periodic power during harvests, and within farmworker culture there is a tradition of harvest-time action—sabotage, slowdowns, strikes—all of which existed before the UFW came around. In the UFW years of the 1970s, the Salinas Valley was responsible for 70 to 80 percent of the lettuce sold in the country. That lettuce was cut and packed by about 3,000 workers, organized in piece-rate crews. These crews were paid collectively for each box of lettuce they produced, and the money was split evenly among them. The crews were made up of friends, relatives or paisanos from the same small towns in Mexico. They stayed together from season to season and developed a high degree of internal solidarity. Lettuce-cutting and packing was a craft that demanded incredible skill, and they were paid very good wages. In the late 1970s, lechugeros [lettuce workers] made $12 an hour, or almost $50 an hour in today’s wages, making them among the highest-paid members of the US working class. 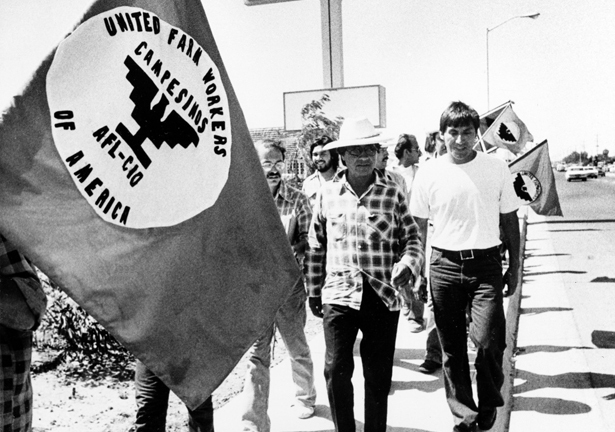 These crews were the core strength of the UFW. They were the reason the union won various strikes and elections. Many of these workers came to the US with radical politics. In some ways the story of the UFW is not that different from the rest of US labor history, in which left Italian, Jewish, Irish and Spanish immigrants helped build the US labor movement. Unless you appreciate these folks—for example, if you take the history of the union as just an aspect as Cesar’s biography—you don’t get it. So you have these militant workers, who are often overlooked during discussions of the UFW. But you also have Cesar Chavez, a brilliant leader who was able to build a lasting union where others had failed. Yes, and by the time he formed what would become the UFW in 1962, he already had extensive organizing experience. For the previous decade he had been organizing the Community Service Organization, which was the most powerful Mexican-American organization in the United States. In CSO, Cesar was under the tutelage of Fred Ross and Saul Alinsky. These were serious people doing politics for a living, with developed theories on how to organize. So it was no accident that the same people who built the CSO—people like Cesar, Gilbert Padilla and Dolores Huerta—would later build the UFW. It was not just luck. I argue in the book that within Alinskyism there is a celebration of the organizer as hero, a view that rank-and-file leaders are so trapped by their ambitions and interests that they need an outside organizer to show them the way. Cesar was taught that for ten years. And his own experience seemed to confirm it. He would go from place to place—spending ninety days in a community that was divided and putting together an organization. He seemed to be making something out of nothing. What I think he brought from that was an organizer-centric view of the way to do politics—that the organizer is the principal actor and the rank and file is the material acted upon. The first big test of the union came in 1965, when Filipino grapeworkers went on strike in Delano. Chavez was faced with a choice—whether to join the strike or not. Though he was convinced that his group wasn’t ready, he still endorsed the strike. A month later, growers had resumed full production and the strike was effectively broken. It could have been a complete defeat for the nascent movement. So what happened? At the time, Chavez knew that the Southern civil rights movement was getting support from Northern liberals, which was very important to its success. Chavez said, Maybe we can do something like that. That was incredibly farsighted. Even though the strike was over, they kept it alive symbolically. And then they stumbled into a boycott. They didn’t have a boycott in mind—boycotts at that point were unused or ineffectual. But the UFW developed the most effective boycott in US history, with millions of people refusing to buy grapes. They forced the growers to sign contracts even though the growers had won in the fields. The growers were furious—they couldn’t sell their damn grapes. Chavez was perfectly positioned to organize that boycott. He was an autodidact, a self-educated man whose curiosity had not been destroyed by school. And he had something authentic to say to all parts of the coalition—union members, consumers, churches, Chicanos and students. Chavez becomes the first Chicano to become a national player. Importantly, he did it like Jackie Robinson: he didn’t compromise or remake himself. He was proud of his background. But the grape boycott also reinforced the idea that farmworkers themselves weren’t going to be able to win: power comes from the supporters. And the grapeworkers, for various reasons, were not as powerful as vegetable workers. For one thing, in grapes people worked on big crews but were paid in small groups. There was not the same collective ethos as on the vegetable crews. One of the ironies of the UFW is that while it attracted people who were skeptical of traditional unions, with their conservative politics and top-heavy bureaucracies, the UFW had some serious structural problems. There were no locals in the UFW. If you were a rank-and-file farmworker, there was no way you could become a local official or elected onto staff. People on staff owed their jobs to people above them, not below them. So people in the fields had no structural power within the union. In all unions there are some contradictions between the rank and file and union staff. That’s just the nature of the beast, and there’s nothing necessarily wrong with that. But in the UFW the contradictions were more intense, because there were no locals and because the staff had sources of income independent of union dues. Most of the time, the union made more money from outside sources—individual donations, foundation grants, contributions from other unions and government programs—than from dues. So ultimately the survival of the staff was not tied directly to membership. That’s a big problem. That relates to the “two souls” of the UFW that you mention in the subtitle. Can you explain what you mean by this notion? I think the union had its Mexican farmworker soul and its Chicano and white boycott advocacy soul. This is not just metaphorical. If you worked on the boycott for six consecutive months you were a member of the union, just like a person working under a grower contract. When the boycott and advocacy souls worked in conjunction with the farmworker soul, you had a great force. Farmworkers by themselves, because of the periodic nature of their power, weren’t able to build a union. What the UFW did was unite their periodic power with the power of supporters in the cities through the leverage of the boycott. But the UFW didn’t give the farmworker soul enough structural power inside the union, and that did the union in. That tension came to a head in 1979. Can you explain what happened? There was a long vegetable strike that started in Imperial Valley and moved to Salinas. Chavez kept limiting the size of the strike, because he had the image of the grape struggle in mind: he wanted to keep the strike minimally alive but to organize an effective lettuce boycott. The lettuce workers who had been elected to the strike committee—the heroes of my book—wanted to expand the strike. There was a meeting before the UFW convention where Chavez tried to convince the rank-and-file leaders to reduce the strike and go out on the boycott, but the workers refused. It was a bit of a humiliation for Chavez. Instead, out of the meeting came an agreement that the resolution at the convention would endorse both the strike and the boycott. But at the convention, one of the rank-and-file leaders, Mario Bustamante, took a look at the resolution and saw that it only endorsed the boycott. So he wrote an amendment endorsing an all-out strike and introduced it, and it was passed overwhelmingly. The workers expanded the strike, and within two weeks they got their first contract. Within a month they’d won it. But they won the strike only after defying Chavez. Here is where I am perhaps most critical of Chavez. A wise political person in that position should have come back to Salinas, made peace with the people who opposed him and taken credit for the victory. That’s not uncommon in the annals of political history. But Chavez had been surrounded by “yes” people for a very long time. There was no tradition of dissent within the union. The strike leaders wanted power in the union commensurate with their power in the fields, and were willing to fight for it. Chavez considered their power a threat to his control of the union, and opposed it. Yes, but the point is not to trash the UFW but to understand what happened to it. The union had powerful enemies. Agribusiness is strong and flexible. On our side of the picket line, however, there was a war inside the union, and Chavez won. And in the process of winning he trampled on the very best in the union, and set it up for defeat. Today the UFW only has about 5,000 members, who work under conditions not much different from the current low standards in the California fields. So do you see any hope for the future of farmworker organizing? I think the Coalition of Immokalee Workers and the Farm Labor Organizing Committee know that in the UFW the boycott tail wagged the farmworker dog. They seem highly conscious that while they garner support, they should keep their eye on their true base. That’s the sense I get. Nor is this just a problem with the UFW. When you have significant middle-class support for a working-class movement, there will always be a problem of who retains control. Farm work has not been mechanized out of existence. It’s still a craft. There’s hope in that. Look at what happened in Alabama. They passed these anti-immigrant laws and immigrants left, and the state lost the tomato and watermelon harvests. It wasn’t that growers weren’t willing to pay fairly decent wages but that they couldn’t find people who could do the work. Imagine if all the electricians or plumbers disappeared—it wouldn’t be easy to replace them. These are skilled workers, and they have power during harvest time. That can be the basis for some sort of renewed militancy in the fields. Gabriel ThompsonGabriel Thompson is a journalist and author in Oakland. His most recent book is Chasing the Harvest, an oral history collection from California's fields.